These high temperature M12 extension cables can be used at temperatures up to 205°C, not limited to the 85°C rating common with most other cables. Made with FEP insulated and jacketed cable, and Liquid Crystal Polymer overmolded connectors, these M12 extension cables can really take the heat. The M12CM-RTD extension cables were designed specifically to work with our higher temperature rated PR-26 and PR-31 RTD sensors, but they can be used with any of our M12 enabled RTD and Thermistor temperature sensors. 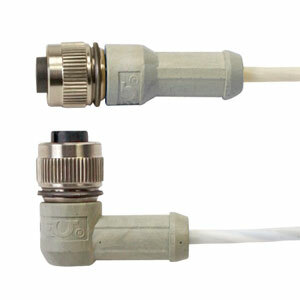 The M12CM high temperature extension cables are supplied with straight or right angled female connectors to easily connect to the male M12 connectors used on all of our M12 enabled sensors. The 4-color cable allows them to be used with any wiring configuration, and standard lengths of 2, 5, 10, 15 and 20 meters allows for off-the-shelf cable solutions for just about any application. For cables to be used with thermocouple probes, please check out our Model M12CM-TC fully compensated thermocouple cables. 10 meter (33 foot) Long Cable with a Straight Female Connector and Stripped Leads. Note: All standard models are provided with a straight or right angled female connector on one end (to connect with the male connectors on our probes) and stripped leads on the other. For longer cables, change the last number in the model number to the desired length in meters and add $3 per meter to the price. To add an over molded M12 connector to the stripped end add “-SF”, “-SM”, “-RF” or “-RM” before the length callout for an additional cost of $15.